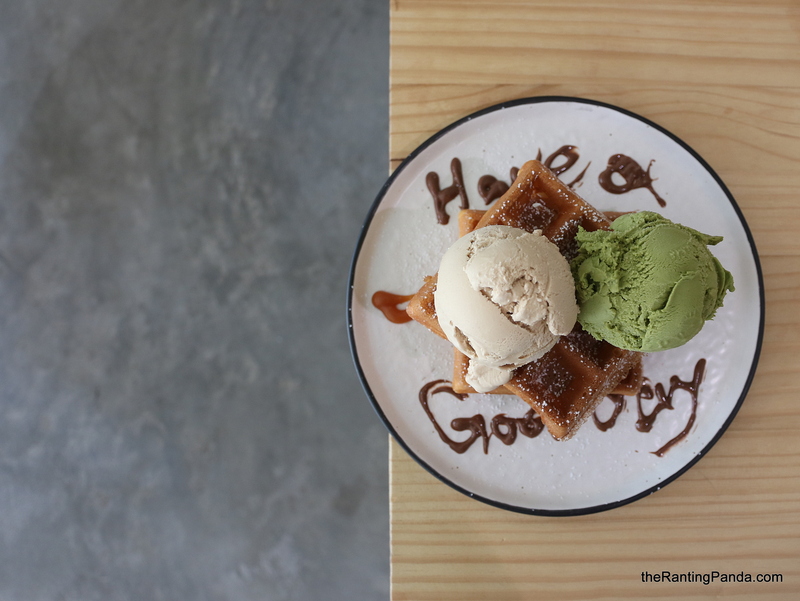 The Place Located minutes walk from Serangoon’s Nex, Cottontail Creamery opened late last year, helping to plug a gap for a credible after-meal dessert cafe in the northeast. I am surprised to find that the owners are in fact Taiwanese, although their usual exemplary service standards did not rub off on their staff as with the less-than encouraging comments we have heard of the staffs’ service attitude. It is a fairly large space for a neighbourhood cafe, taking up two units along the ground level of a HDB block. We noticed how the owners paid close attention to the decor, keeping to an extended-kitchen theme, with greenery all-round. There are also plenty of couple tables, with a large communal table at the end, catering to groups of varying sizes. The Food It is an affair with gelato for now, though brunch food will be introduced at a later date this year. Some of the interesting flavors we spotted during our visit include Extra Virgin Olive Oil & Blackcurrant, Mont Blanc Chestnut and Passion Fruit Meringue, with adolescent-unsuitable but grown-up-most-loved Craft Beer IPA gelato! Since it was our first visit, we went for our personal favourites (read: safe) including Uji Matcha with Honey and Russian Earl Grey. The Double Scoop Ice Cream here costs S$6.50, with Single Scoop at S$3.50; while the premium flavours here go for an additional S$1. We decided to go for the gelato with Waffles (S$4.80), and that was retrospectively a right decision. The Matcha gelato is on the sweet end, while satisfying, though we wouldn’t mind if they step up on the intensity of the matcha. The Russian Earl Grey is on point, and we recommend you to give this flavour a try. You can also get your coffee fix here, where I had the Flat White (S$5), which is a decent shot with the right intensity and body. Will try the Matcha Latte ($5) next time! Rants No one likes ordering their sweet treats from a cold apathetic service staff. Will I Return Again? We are looking forward to returning since there are just so few credible cafes in the northeast, and fortunately Cottontail Creamery hit some right notes for us. Let’s hope we wouldn’t need to rant on the same rant again when we return.